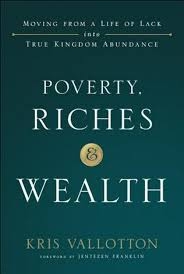 Poverty, Riches & Wealth h/c | Karmal Books online Christian books and media store. In this eye-opening study of what the Bible really says about money, poverty, riches, and wealth, Vallotton will shake up what people thought they knew, showing that Kingdom prosperity always begins from the inside out. When one learns to cultivate a mindset of abundance, the wealth of heaven will be experienced in every area of life.